Chics Who Execute Mastermind Meeting! Let’s get together and let 2019 know what time it is! Be confident in your Who, What, When, Where, Why, How, and How Much without batting an eye! Will you be on of my Executing Eleven? Grab your business cards, a friend, and your favorite pen and get ready to learn, connect and grow! 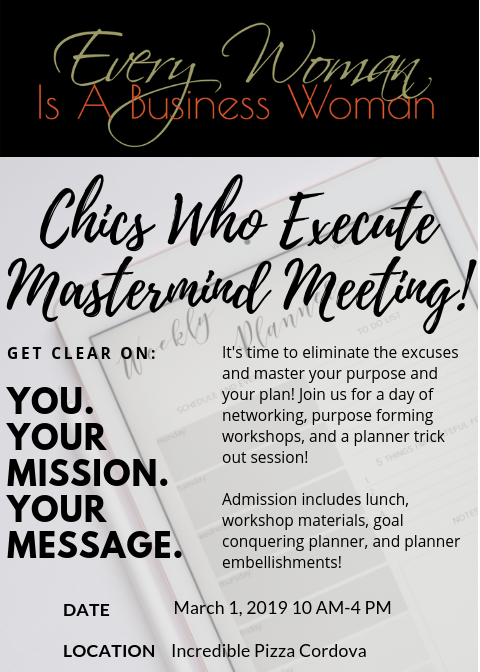 Start the day with event host, author, speaker, and coach Tammie Polk as she dives into her Every Woman Is A Business Woman workshop and end it with all of the planner embellishments and supplies needed to make your planner sparkle and shine!